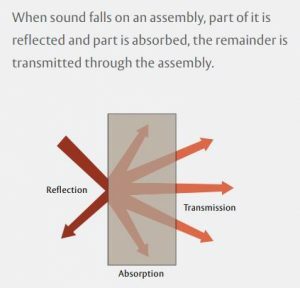 An important design consideration in any building is sound attenuation. Noise has a significant effect on how people function on a daily basis. Without the correct building products in place to control sound, a simple task or even just relaxing becomes very difficult. To understand more about sound rated door assemblies, visit Ceco Door, Curries and Fleming to see a wide range of application-specific features and options. Due to the wide range of sound intensity, rating systems were developed to classify how well a building partition attenuates sound. For example, a school band room needs a door & frame system with a high rating, whereas an office opening might require a lower rating. This is a relatively simple concept, but it gets confusing when trying to compare different types of sound ratings. The various rating classes listed here are not intended to be compared against each other – at least not on an apples-to-apples basis. STC is the most common rating used by manufacturers of building products, but other rating classes are tested and represented in the market. OITC, NIC, and ASTC are the other three common sound ratings and all have unique benefits for certain applications. STC ratings are simply the amount of decibels that a partition absorbs. 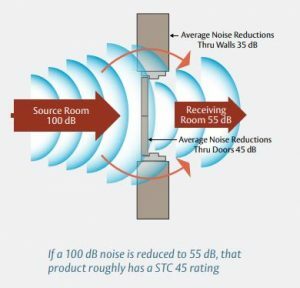 If you have 100 decibel tone measured in the source room and 55 decibels measured on the receiving side of the partition, the difference gives you the STC rating of 45 in this example. STC is lab tested in a controlled environment and only takes into account the partition between two spaces. For door & frame openings, the partition is built to a very high STC rating so that the noise passing through the partition is specific to the door opening assembly. While STC ratings are most accurate for speech, OITC tests lower frequencies that are the result of aircraft, rail or truck traffic, and mechanical equipment. This makes OITC more applicable for exterior openings – especially if in close proximity to an airport or train line, or doors that lead into a factory or manufacturing plant. Similar to STC, OITC is lab tested in a controlled environment. NIC, or noise isolation class ratings are based on field tests. The benefit of NIC is that the test is performed in the actual environment where the product is installed. However, the rating is highly dependent on the field conditions of the tested space. This test compares sound isolation between two spaces and takes into account the partition between the spaces as well as sound absorption properties in the receiving space such as furniture (carpet/rugs/etc.). So an NIC rating is limited to that particular space and may not be achieved in another area of the building or another project. Like NIC, ASTC is field tested. However, ASTC focuses on the partition only without any influence from the rooms on either side. ASTC is ideal for diagnosing flanking, which is indirect sound leakage that makes its way around, over or under the main separating element. This test method is ideal in determining installation errors or conflicting building materials at specific openings. There are advantages and disadvantages to both lab tests and field tests. A certificate from an accredited lab provides credibility to the market. Field tests give you an actual rating for the opening in its intended setting and accounts for the entire partition beyond just the door opening. However, it is important to note that a field test is only representative of that particular location. Field tests are allowed a tolerance to vary from lab tests, typically up to a 5 point reduction in rating, and keep in mind if testing the same space for both NIC and ASTC – you’ll most likely get different ratings.